On May 12, it was confirmed that a meltdown had occurred at the No. 1 reactor, forcing the utility to abandon the water entombment idea and try to install a new cooling system that decontaminates and recycles the radioactive water flooding the reactor’s turbine building instead. The official added, “Unless we understand the extent of the damage, we don’t even know how long that work alone would take,” noting the need for one or two months more than previously thought to establish an entirely new cooling system. Coming a day after he blasted Tepco’s flip-flop over the injection of seawater into the plant’s reactor 1, Edano said the government “cannot respond to this matter on the premise” that no more undisclosed information will emerge. “There is a distinct possibility that there is still more,” he said, urging Tepco to accurately and swiftly report the truth to the government. Hosono also noted Tepco’s delay in revealing this fact, 2? months after the nuclear crisis started. You’ve already heard that 3 of the Fukushima reactors melted down within hours of the earthquake. Not only the pressure vessels, but the containment vessels of the Nos. 1 to 3 reactors at the Fukushima No. 1 nuclear power plant were probably damaged within 24 hours of the March 11 earthquake and tsunami, according to Tokyo Electric Power Co.’s analysis of the nuclear crisis. A senior nuclear regulatory official in the United States said Thursday he believed there was a “strong likelihood” of serious core damage and core melt at the Fukushima No. 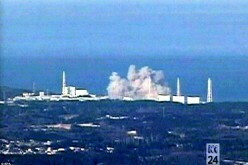 1 power plant in the days immediately after the crisis began. The NRC also had “suspicions” about the conditions of the spent fuel pools, Borchardt said after a speech at the Japan Society in New York. Based on that assumption, he said, the NRC recommended that U.S. residents in Japan stay 80 km away from the crippled power plant, which was far beyond the Japanese government’s recommendation for residents within a 20-km radius to evacuate. Buildings housing the plant’s nuclear reactors are still standing open in the wake of crippling hydrogen explosions that followed Japan’s March 11 earthquake and tsunami. 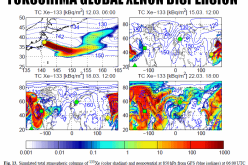 The approaching storm could scatter highly radioactive materials into the air and sea. 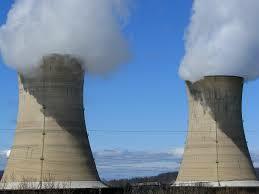 Plant operators are currently spreading “anti-scattering agents” around the buildings housing reactors one and four. As I’ve predicted for a long time, the Fukushima disaster could end up being much worse than Chernobyl. See this, this, this and this. Radiation released by the crippled Fukushima Daiichi nuclear power plant has caused soil contamination matching the levels seen in the Chernobyl disaster in some areas, a researcher told the government’s nuclear policy-setting body Tuesday. It’s not just the soil, it’s also the seafloor. 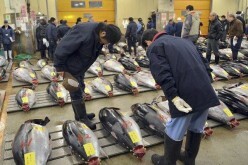 NHK notes that radiation has been found in the entire 300 kilometer (186 mile) region of the coast tested near Fukushima. Just because mega-radioactive water leakage was not enough. From Xinhua: “Operator of the troubled Fukushima No. 1 nuclear power plant found that oil has been leaking into the sea close to the facility, the Kyodo News reported Tuesday. The operator Tokyo Electric Power Co. (TEPCO) said the oil leaks were possibly from nearby oil tanks that may have been damaged in the March earthquake and tsunami, and it would set up oil fences to prevent the liquid from pouring into the Pacific Ocean.” Oh, but they only discovered this now? Odd how it took nearly 3 months for those oil tanks to rupture and start spilling into the water.